Replacing your vehicle is not as difficult as most people assume. The ideal combination of a high quality pre-owned car and excellent fuel economy can give you a lot of bang for your buck. Just because youre on a budget doesnt mean you cant get everything you want. You can find an extensive inventory of fuel efficient vehicles at one of the leading used car dealers near Boston. Check out Quirk Pre-Owned; where you dont have to haggle to get a great deal. When you save money on a vehicle that has excellent fuel economy ratings, you’re getting double the savings. Check out one of your favorite used car dealers near Boston, Quirk Pre-Owned, to browse our extensive inventory. We have a wide variety of fuel efficient vehicles, like the 2013 Hyundai Sonata and 2012 Honda Civic. It’s not secret that gas isn’t free; if that were the case I think most drivers would be driving very different vehicles than their current ride. Since you have to pay for gas, it makes sense to drive a car that needs it as infrequently as possible. Choosing a quality used car that is incredibly fuel efficient delivers the most savings possible. 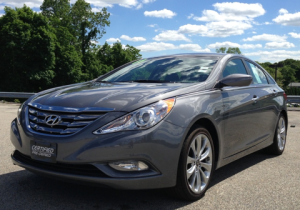 The 2013 Hyundai Sonata is a sleek sedan with body lines that melt from the front grille to rear bumper. Equipped with a 2.4-liter four-cylinder engine, this vehicle gets 24 mpg city and 35 mpg highway. The 2012 Honda Civic is also a great fuel efficient used options. This classic car has seen the road of decades before this, upgrading and redesigning along the way. Offering a whopping 28 mpg city and 39 mpg highway, this sedan is a no-brainer. Fuel efficiency is one of the few guaranteed ways to consistently save money on the road. Check out Quirk Pre-Owned to test-drive one of our quality Boston areaused cars, and let the savings begin. For more information call us at (877) 466-1512 today!